This stunning arrangement is made of roses, pansies, star gazer lilies, Iris, and many other flowers. They are just beautifully done. 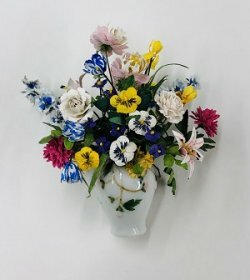 It is in a white porcelain vase with a floral design with gold trim. This arrangement stands a little over 2 1/2" tall and spreads to about 3" width.